Theme offers super flexibility for color editing and easily turns from a minimalistic style theme into a juicy website with great animation effects. Custom admin significantly extends original Wordpress functionality, turning it into an all-in-one tool for content management. Real-time WYSIWYG editor: customize the look of your website directly on page and see changes right away - what you see is what you get! Display your project images in a slider format. You can add as many images as you want, and use images of different size as well. Increase wordpress theme features minimal design that will be friendly to all possible customization you might want to apply. Theme offers super flexibility for color editing and easily turns from a minimalistic style theme into a juicy website with great animation effects. 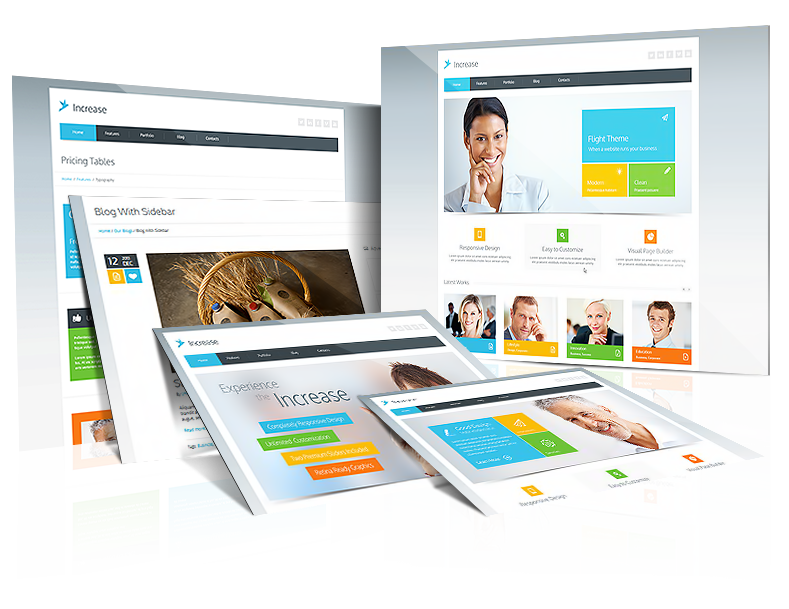 Increase Wordpress theme is main feature - is an ability to change color easily precisely for any element. Great customization possibilities are offered by the new version of cmsmasters’ custom wordpress admin panel. The 1.2.1 admin version features all the functionality of 1.2 version, but also includes more customization options. In fact, your wordpress website can be easily turned into a completely custom-designed website, and there is no need to deal with any code for this. All the customization is playfully easy, reminds more of a game rather than website setup. A 100% Responsive, Retina ready, Halsey WP Theme is guaranteed to have an ultimate look on large desktop screens, and on mobile devices screens. When code is clean and optimized to the most up-to-date SEO requirements, getting to the top of the SERPs turns out to be much easier to achieve. Step-by-step descriptions on how to implement every feature, with lots of screenshots and even videos that even a child can understand. The course takes you through the essential steps of Pranayama and Cleansing and then Hatha Yoga. The course is well organised and documented with course notes and practice at home instructions.